After brisk voting on Tuesday and Wednesday, round one of Junto March Madness 2019 continues with the second half of this round’s matchups. Voting for these matchups will end on Friday at 5:00pm EST. A few things to remember: this is supposed to be fun! Try to enjoy it. We encourage you to take this tournament as an opportunity to explore digital projects that you haven’t seen before, rather than just voting for the ones you already know. Let us know what you find in the comments below, or by tweeting using the hashtag #JMM19. Junto March Madness 2019: Voting Begins for Round 1! Will there be upsets? Which digital project will be this year’s Cinderella story? Who will earn immortal glory as the #JMM19 victor? 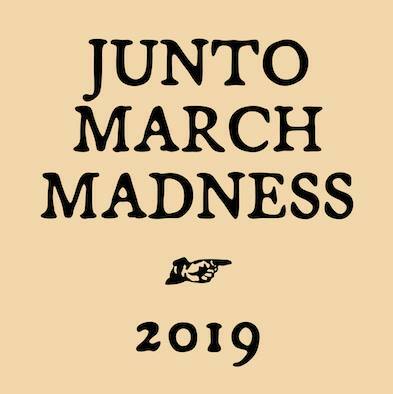 Today, we will start to answer those questions, as voting begins for Junto March Madness 2019. We announced the matchups on Monday and we will begin with voting for the first four of our eight brackets today. Voting will end on Wednesday at 5:00pm (EST). Voting for brackets five through eight will begin on Thursday and end on Friday. We encourage you to not just vote for your favorites, but to take the opportunity to explore some of the digital projects that you haven’t had the opportunity to use in the past. As you do so, feel free to share your thoughts in the comments below or on Twitter using the hashtag #JMM19. As always, we hope you will engage with this competition in the spirit of good fun. Are you ready? It’s time to unveil the brackets for Junto March Madness 2019. This year, the tournament focuses on digital history projects relating to Vast Early America. Readers nominated an excellent field of digital projects, including venerable favorites and young scrappy upstarts. Voting will begin this week in separate posts. Junto March Madness 2019 Begins! It’s once again March and that can only mean one thing at The Junto: our March Madness tournament. We skipped last year to welcome our new members, so in case you’ve forgotten: you nominate, we bracket, and you vote. In previous years, we have hosted tournaments of books, articles, and primary sources in early American history. This year, our tournament will focus on digital projects on early America.